Through a series of guided questions, students will explore the question, what will Earth's climate be in the future? Students will not be able to answer the question at the end of the lesson, but they will be able to explain how scientists can be certain that Earth is warming while not being entirely certain about how much Earth will warm. Tell students that Activity 1 (Constructing an Argument) of the lesson What is the Future of Earth's Climate? introduces the structure of the scientific argumentation they will be asked to do in the rest of the lesson. Tell students that Activity 1 will give them practice with analyzing a data set and making a good scientific argument from the evidence. Encourage students to review the questions and example best answers provided in Activity 1 before starting on the current activity. Students are introduced to the unanswered question about the future of Earth's climate. They explore data showing temperature changes over the past 120 years and data illustrating climate trends over different time scales. Students evaluate the information the data provide and consider the limitations of conclusions based on the data. This activity is part of a sequence of activities in the What Is the Future of Earth's Climate? lesson. The activities work best if used in sequence. 1. Activate students' prior knowledge about Earth's climates. Tell students that climate scientists use the average temperature of the Earth as a measure of climate change. Ask: ﻿Has Earth always had the same climates as it has today? ﻿(No. Earth has gone through many climatic shifts in its history, including ice ages and warm periods.) Tell students that they will be looking at global temperature data to investigate how different Earth's climates might be in the future. Tell students that science is a process of learning how the world works and that scientists do not know the “right” answers when they start to investigate a question. Tell students they can see examples of scientists' uncertainty in climate forecasting. Tell students they will be asked questions about the certainty of their predictions and that they should think about what scientific and model-based data are available as they assess their certainty with their answers. Encourage students to discuss the scientific evidence with each other to better assess their level of certainty with their predictions. 3. Have students launch the Earth's Changing Climates interactive. Provide students with the link to the Earth's Changing Climates interactive. Divide students into groups of two or three, with two being the ideal grouping to allow students to share computer work stations. Tell students they will be working through a series of pages of data with questions related to the data. Ask students to work through the activity in their groups, discussing and responding to questions as they go. NOTE: Teachers can access the Answer Key for students' questions—and save students' data for online grading—through a free registration on the High-Adventure Science portal page. Tell students that this is Activity 2 in the What Is the Future of Earth's Climate? lesson. ﻿4. Have students discuss what they learned in the activity. How has Earth's average temperature changed over the past 400,000 years? How do scientists determine what the temperature was 400,000 years ago? What makes scientists more confident in their predictions of future climates? In this activity, students use computational models to explore how Earth's surface and greenhouse gases interact with radiation. 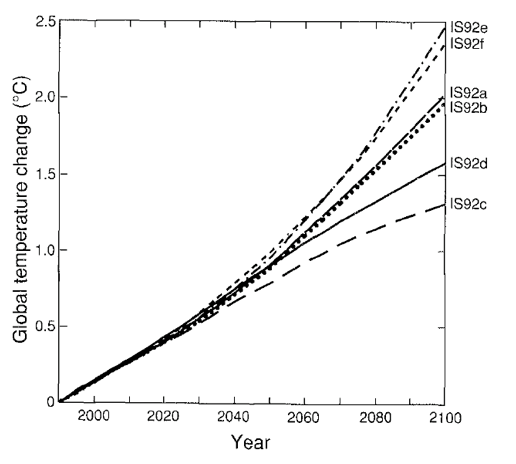 Then they interpret real-world changes in atmospheric carbon dioxide over short and long time frames. 1. Activate students' prior knowledge about greenhouse gases. Tell students that greenhouse gases cause a warming of Earth's atmosphere. Have students brainstorm a list of greenhouse gases and hypothesize how they warm Earth's atmosphere. Student responses should include greenhouse gases such as carbon dioxide, water vapor, and methane. Responses about how these gases warm Earth's atmosphere should include that the gases prevent the escape of heat energy (infrared radiation) from the atmosphere. Tell students that science is a process of learning how the world works and that scientists do not know the “right” answers when they start to investigate a question. Let students know they can see examples of scientists' uncertainty in climate forecasting. Tell students they will be asked questions about the certainty of their predictions and that they should think about what scientific data are available as they assess their certainty with their answers. Encourage students to discuss the scientific evidence with each other to better assess their level of certainty with their predictions. 3. Discuss the role of systems in climate science. Tell students that forecasting what will happen in Earth's climate system is a complicated process because there are many different interacting parts. Scientists think about how one part of the system can affect other parts of the system. Give students a simple example of a system, as described in the scenario below. Tell students that these simple cause-effect relationships can expand into more complex system relationships. Let students know that they will be exploring cause-effect and system feedback relationships between carbon dioxide and water vapor in this activity. Ask students to think about how each piece of the system affects other pieces of the system. scientists use information about the past to build their climate models. scientists test their climate models by using them to forecast past climates. when scientists can accurately forecast past climates, they can be more confident about using their models to predict future climates. 5. Have students launch the Interactions Within the Atmosphere interactive. Provide students with the link to the Interactions Within the Atmosphere interactive. Divide students into groups of two or three, with two being the ideal grouping to allow groups to share a computer workstation. Tell students they will be working through a series of pages of models with questions related to the models. Ask students to work through the activity in their groups, discussing and responding to questions as they go. Let students know that this is Activity 3 of the What Is the Future of Earth's Climate? lesson. 6. Have students discuss what they learned in the activity. What two things can happen to solar radiation as it enters Earth's atmosphere? Which type of solar radiation is absorbed by greenhouse gases? What is the long-term trend of carbon dioxide concentration in the atmosphere and global temperature? Students explore the relationships between ocean surface temperature and levels of atmospheric carbon dioxide and water vapor. 1. Activate students' prior knowledge about carbon dioxide in the Earth system. Let students know that in this activity they will be asked questions about the certainty of their predictions. Tell them to think about what scientific data are available and the evidence they get from the model as they assess their certainty with their answers. Encourage students to discuss the scientific evidence with each other to better assess their level of certainty with their predictions. Explain that science is a process of learning how the world works and that scientists do not know the “right” answers when they start to investigate a question. Tell students they can see examples of scientists' uncertainty in climate forecasting. 5. Have students launch the Sources, Sinks, and Feedbacks interactive. Provide students with the link to the Sources, Sinks, and Feedbacks interactive. Divide students into groups of two or three, with two being the ideal grouping to allow groups to share a computer workstation. Tell students that they will be working through a series of pages of models with questions related to the models. Ask students to work through the activity in their groups, discussing and responding to questions as they go. Tell students this is Activity 4 of the What Is the Future of Earth's Climate? lesson. How is the solubility of carbon dioxide affected by temperature? How do atmospheric carbon dioxide levels affect ocean temperature? What is the effect of water vapor on temperature? Why is the relationship between carbon dioxide and water vapor considered a positive feedback relationship? Students use interactive computational models to explore how light-colored surfaces such as snow, ice, and some clouds have a cooling effect on Earth. Then they interpret real-world data to examine the positive feedback loop between ice coverage and temperature. This activity may be used individually or in groups of two or three students, or as a whole class activity. If using as a whole class activity, use an LCD projector or interactive whiteboard to project the activity. 1. Activate students' prior knowledge about reflection and absorption. Tell students that they will be asked questions about the certainty of their predictions and that they will need to think about what scientific data are available as they assess their certainty with their answers. Encourage students to discuss the scientific evidence with each other to better assess their level of certainty with their predictions. Tell students that they will be exploring cause-effect and system feedback relationships between carbon dioxide and water vapor in this activity. Ask students to think about how each piece of the system affects other pieces of the system. 5. Have students launch the Feedbacks of Ice and Clouds interactive. Provide students with the link to the Feedbacks of Ice and Clouds interactive. Divide students into groups of two or three, with two being the ideal grouping to enable sharing computer workstations. Tell students they will be working through a series of pages of models with questions related to the models. Ask students to work through the activity in their groups, discussing and responding to questions as they go. Tell students this is Activity 5 of the lesson What is the Future of Earth's Climate? How do ice, snow, and clouds affect temperature? Why is it colder on clear nights than on cloudy nights? If the sea ice melts, how might that affect global temperature and the atmospheric concentrations of carbon dioxide and water vapor? Students explore how solar radiation, Earth's surface and oceans, and greenhouse gases interact to cause global warming. They can change variables to determine how much greenhouse gas emissions might need to fall to mitigate the temperature increase. 1. Activate students' prior knowledge about greenhouse gases and global warming. Science is a process of learning how the world works and that scientists do not know the “right” answers when they start to investigate a question. Tell students they can see examples of scientists' uncertainty in climate forecasting. Tell students that the ability to better predict near-term events occurs in hurricane and tropical storm forecasting as well. Project The Definition of the National Hurricane Center Track Forecast Cone and show students the “cone of uncertainty” around the track of the storm. Tell students that the cone shows the scientists' uncertainty in the track of the storm, just as the climate models show the scientists' uncertainty in how much Earth's temperature will change in the future. Tell students they will be asked questions about the certainty of their predictions and that they will need to think about what scientific data are available as they assess their certainty with their answers. Encourage students to discuss the scientific evidence with each other to better assess their level of certainty with their predictions. Tell students that these simple cause-effect relationships can expand into more complex system relationships. 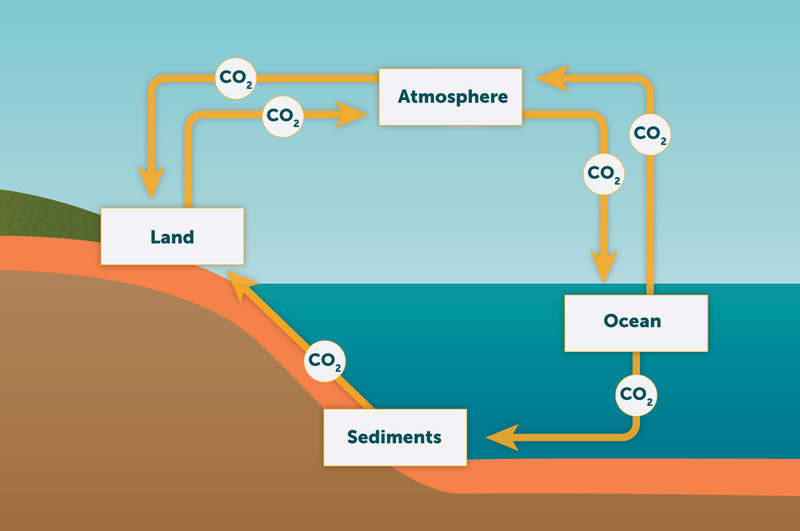 Let students know they will be exploring cause-effect and system feedback relationships between carbon dioxide and water vapor in this activity. Ask students to think about how each piece of the system affects other pieces of the system. 5. Have students launch the Using Models to Make Predictions interactive. Provide students with the link to the Using Models to Make Predictions interactive. Divide students into groups of two or three, with two being the ideal grouping to allow students to share a computer workstation. Tell students they will be working through a series of pages of models with questions related to the models. Ask students to work through the activity in their groups, discussing and responding to questions as they go. Tell students this is Activity 6 of the lesson What Is The Future of Earth's Climate? What is the relationship between greenhouse gas emissions and Earth's temperature? Why does the temperature not decrease immediately after greenhouse gas emissions decline? Why do scientists think the warming of the 20th century cannot be explained by natural variability? Use the answer key to check students' answers on embedded assessments. Scientists use past and current temperature data to develop climate models to predict how warm the planet might get. Scientists use ancient sediments and ice cores to measure past temperatures. They put these data into sophisticated computational models to make predictions about the future. When scientists can accurately predict past climates with their inputs and algorithms, they can be surer that their models will be able to correctly predict future climates. There are many different factors that can affect Earth's atmosphere and temperature, and scientists continually update their models to reflect as many of these interactions as they can. Computational models are used to explore phenomena that are too large, too small, too quick, or too slow to observe otherwise. The computational models with which you may be familiar are used for forecasting weather events such as hurricanes. Scientists are more confident in the output of their models when they can input a lot of data. Other scientists check their models against what happens in reality; when the model accurately reflects what happens in reality, scientists can be more confident in their models. Greenhouse gases warm the atmosphere by trapping outgoing heat (infrared) radiation. Sunlight brings visible (and ultraviolet and infrared) light to Earth. The radiation can be absorbed by Earth's surface, or it can be reflected back into space. The radiation that is absorbed heats molecules in Earth's surfaces. This heat energy, or infrared radiation, is radiated back out towards space. The infrared energy can be absorbed and re-emitted by greenhouse gases in the atmosphere. This absorption and re-emission keeps heat trapped in the atmosphere for longer periods of time, leading to an increased atmospheric temperature. Like all matter, carbon cycles throughout the Earth system. Carbon dioxide is released into the atmosphere from rocks as they weather. It is taken up by plants and incorporated into proteins, carbohydrates, and fats. It is released when organisms respire, and it is released when fossil fuels are burned. Carbon dioxide is removed from the atmosphere when it dissolves into the ocean. The oceanic uptake of carbon dioxide is temperature-dependent. Carbon dioxide, like all gasses, is less soluble in water as the water temperature warms. So as Earth warms, the oceans are less able to remove carbon dioxide from the atmosphere. At the same time, the increased temperature resulting from increased levels of atmospheric carbon dioxide causes water to evaporate from the ocean surface. Water vapor is a powerful greenhouse gas. With increased water vapor in the atmosphere, the temperature increases ever more. The relationship between atmospheric carbon dioxide and water vapor is a type of positive feedback–an increase in one leads to an increase in the other, leading to a continual increase in temperature. Solar radiation consists of visible light, infrared radiation (heat), and ultraviolet radiation. When solar radiation encounters Earth's atmosphere and surface, it can be reflected (sent back into space) or absorbed. Energy that is absorbed becomes heat in Earth's surface. This heat can be re-radiated into space. Light-colored surfaces reflect more solar energy than dark-colored surfaces. Infrared radiation is emitted by Earth's surface. Instead of the infrared radiation being allowed to exit Earth's atmosphere into space, greenhouse gases absorb it and re-emit it, keeping more heat in the atmosphere. Greenhouse gases include carbon dioxide, methane, and water. Clouds can have a cooling effect or a warming effect, depending on their makeup and position in the atmosphere. High-level clouds have a net cooling effect as they block incoming solar radiation. Low-level clouds have a net warming effect as they prevent infrared radiation from escaping into space. visual representation used in graphs to indicate the uncertainty in a measurement. phenomenon where gases allow sunlight to enter Earth's atmosphere but make it difficult for heat to escape. A unit of measure of the amount of dissolved solids in a solution in terms of a ratio between the number of parts of solids to a million parts of total volume. calculation that analyzes data by creating a series of averages of different groups of a whole data set. Also called a moving mean, rolling mean, or moving average. part of a physical system that absorbs some form of matter or energy. explosion in the sun's atmosphere, which releases a burst of energy and charged particles into the solar system. ability of a substance to be dissolved or liquified. National Geographic News: Mysterious Clouds More Common Due to Climate Change?